“The main obstacle for Kurdish journalists or journalists covering the Kurdish issue in Turkey is that they are considered ‘terrorists’ and accused of making propaganda of illegal organisations through media”, explained the Turkish journalist-activist Rengin Arslan. Of the 39 media professionals detained in connection with their professional work in the country, 30 cases directly relate to their reporting on the Kurdish issue, according to the latest figures of Reporters Without Borders (RSF). The majority of these journalists, arrested by the Turkish authorities, are accused of creating propaganda for or being a member of the Kurdistan Workers’ Party (PKK) – an armed group, or Union of Communities in Kurdistan (KCK) – an umbrella political organisation. Both groups are banned and listed as terrorist organisations by Turkey. The PKK has fought against the Turkish army since 1984, demanding change from an independent state to autonomy and recognition of their culture rise and identity. The Kurdish minority in Turkey constitutes up to a fifth of the country’s population, with between 14 to 20 million located mainly in the southeastern region. Rengin condemns the fact that many journalists can be accused of supporting or promoting propaganda of terrorist organisations and that the Kurdish media, in particular, is being targeted. Aydin Yildiz, a reporter for the pro-Kurdish Dicle News Agency, was detained in October 2011 and charged for being a member of KCK, for attending demonstrations of civil disobedience and the funerals of PKK members. “Aydin was covering the events and he had been targeted because he was a Kurdish journalist working for an outlet that opposes the administration”, stated Aydin’s lawyer in the Turkey’s Press Freedom Crisis report by the Committee to Protect Journalists (CPJ). Studies conducted by think tanks and human right organisations concur that the main problem in the country is “the lack of the government’s ability to distinguish between reporting on terrorism and terrorist propaganda”. The indictments against journalists are filled with journalistic activities. “You have contact with your editorial desk, with your information sources that may be on the ground. You have contact with people involved in PKK that inform journalists of protests. All this journalistic relation is part of the accusation of the indictments, taking that it is a structural collaboration and it is not journalism”, stated Erol Önderoğlu, representative of RSF in Turkey. The legal framework and the judicial system are the major obstacles for press freedom in the country. 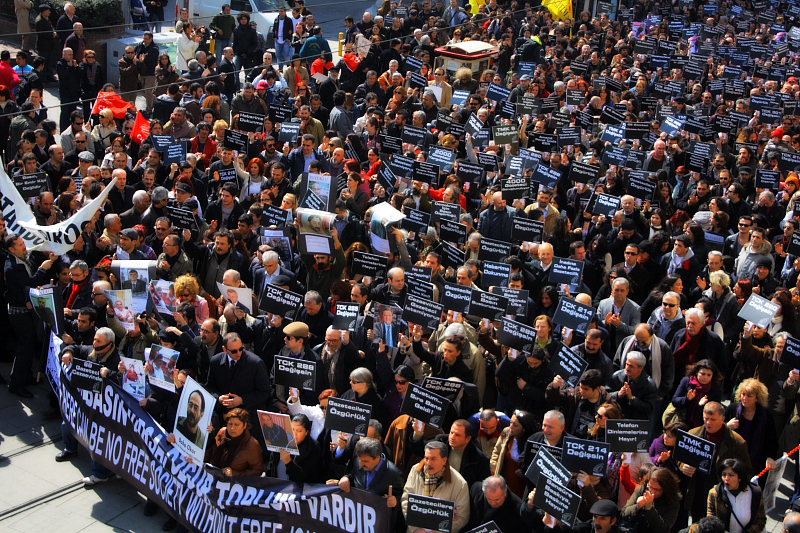 Its opacity provides a broad scope for the Turkish judiciary to accuse and arrest journalists. The Anti-Terror Law, published in 1991 and aimed at a Kurdish rebellion in south-eastern Turkey, provides a wide range of action against pro-Kurdish media and journalists that cover the Kurdish issue as the terms ‘propaganda’ and ‘terrorism’ are vaguely defined. The European Commission Progress Report on Turkey stressed the need for the country to amend its anti-terror legislation. It criticised that the legal framework on organised crime and terrorism is “still imprecise and contains definitions that are open to abuse, leading to numerous indictments and convictions”. Cases in which terrorism or anti-state crimes are alleged are being tried in “special authority courts”, which are endowed by the criminal procedure code with extraordinary powers. It can impede the defendant’s lawyer from accessing the case files and hold suspects in custody for months, even years, without a hearing. The journalist Aydin Yildiz spent 10 months in pre-trial, being released on 13 July 2012 and still awaiting trial. Over the last few years, the government has introduced changes to improve the legal system. A judicial reform package was adopted in July 2012 to end the use of special courts’ authority to regional criminal courts, prohibit the seizure of written work before publication and also ease restrictions on media reporting of criminal investigations. However, “these reforms fall short of a significant improvement regarding freedom of expression”, stated the European Commission. Currently, the Turkish government is working on a fourth judicial reform package to address some of the critics of the European Court of Human Rights. “It is my hope that the fourth reform package will include the much-needed amendments to the Anti-Terror Law and the criminal code; amendments which will clearly distinguish between the exercise of freedom of expression and freedom of the media and any form of support for terrorism”, declared Dunja Mijatovic, the OSCE Representative on Freedom of the Media. The Committee to Protect Journalists reviewed the Kurdish media, concluding, for example, that some of the most targeted media in the Kurdistan region, such as the Dicle News Agency and the daily Özgür Gündem, publish opinion pieces by pro-Kurdish and PKK leaders, which draws particular indignation from the authorities, but do not openly or directly advocate the use of armed violence. Experts in press freedom agree over the need for the government to be more open to critical views over the Kurdish issue, and understand freedom of expression as a two-sided coin with information and ideas that can be favourable and regarded as inoffensive, but can also shock and disturb the authorities. However, the European Union sees that Turkey represses critical views and freedom of the press continues to be further restricted in practice. Prosecutors and courts in Turkey often perceive dissidence and criticism, as well as the expressions of minority identities, primarily as a threat to the integrity of the state. The Turkish judiciary tends to protect the interests of the state instead of the public’s right to receive information. An example of this is the ranking of the World Press Freedom Index of RSF that places Turkey in the bottom, situated in the 154th place out of 179. Turkey was also labelled, last year, as the world’s biggest prison for journalists. “A sad paradox for a country that portrays itself a regional democratic model,” RSF stated.